Explain the consequences of the equation of continuity. where is the volume and is the elapsed time. The SI unit for flow rate is but a number of other units for are in common use. For example, the heart of a resting adult pumps blood at a rate of 5.00 liters per minute (L/min). Note that a liter (L) is 1/1000 of a cubic meter or 1000 cubic centimeters ( or ). In this text we shall use whatever metric units are most convenient for a given situation. Figure 1. Flow rate is the volume of fluid per unit time flowing past a point through the area A. 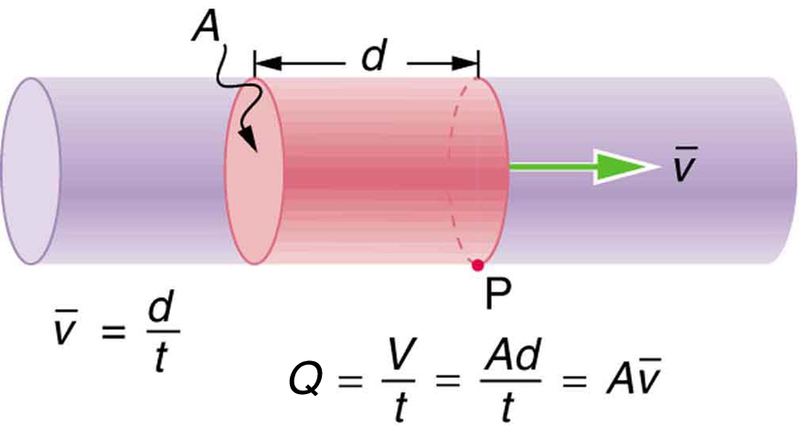 Here the shaded cylinder of fluid flows past point P in a uniform pipe in time t. The volume of the cylinder is Ad and the average velocity is v̄=d/t so that the flow rate is Q=Ad/t=Av̄. How many cubic meters of blood does the heart pump in a 75-year lifetime, assuming the average flow rate is 5.00 L/min? Time and flow rate are given, and so the volume can be calculated from the definition of flow rate. This amount is about 200,000 tons of blood. For comparison, this value is equivalent to about 200 times the volume of water contained in a 6-lane 50-m lap pool. This is called the equation of continuity and is valid for any incompressible fluid. The consequences of the equation of continuity can be observed when water flows from a hose into a narrow spray nozzle: it emerges with a large speed—that is the purpose of the nozzle. Conversely, when a river empties into one end of a reservoir, the water slows considerably, perhaps picking up speed again when it leaves the other end of the reservoir. In other words, speed increases when cross-sectional area decreases, and speed decreases when cross-sectional area increases. Since liquids are essentially incompressible, the equation of continuity is valid for all liquids. However, gases are compressible, and so the equation must be applied with caution to gases if they are subjected to compression or expansion. A nozzle with a radius of 0.250 cm is attached to a garden hose with a radius of 0.900 cm. The flow rate through hose and nozzle is 0.500 L/s. Calculate the speed of the water (a) in the hose and (b) in the nozzle. We can use the relationship between flow rate and speed to find both velocities. We will use the subscript 1 for the hose and 2 for the nozzle. A speed of 1.96 m/s is about right for water emerging from a nozzleless hose. The nozzle produces a considerably faster stream merely by constricting the flow to a narrower tube. The solution to the last part of the example shows that speed is inversely proportional to the square of the radius of the tube, making for large effects when radius varies. We can blow out a candle at quite a distance, for example, by pursing our lips, whereas blowing on a candle with our mouth wide open is quite ineffective. where and are the number of branches in each of the sections along the tube. The aorta is the principal blood vessel through which blood leaves the heart in order to circulate around the body. (a) Calculate the average speed of the blood in the aorta if the flow rate is 5.0 L/min. The aorta has a radius of 10 mm. (b) Blood also flows through smaller blood vessels known as capillaries. When the rate of blood flow in the aorta is 5.0 L/min, the speed of blood in the capillaries is about 0.33 mm/s. Given that the average diameter of a capillary is calculate the number of capillaries in the blood circulatory system. We can use to calculate the speed of flow in the aorta and then use the general form of the equation of continuity to calculate the number of capillaries as all of the other variables are known. The flow rate is given by or for a cylindrical vessel. Note that the speed of flow in the capillaries is considerably reduced relative to the speed in the aorta due to the significant increase in the total cross-sectional area at the capillaries. This low speed is to allow sufficient time for effective exchange to occur although it is equally important for the flow not to become stationary in order to avoid the possibility of clotting. Does this large number of capillaries in the body seem reasonable? In active muscle, one finds about 200 capillaries per or about per 1 kg of muscle. For 20 kg of muscle, this amounts to about capillaries. Flow rate is defined to be the volume flowing past a point in time or where is volume and is time. Flow rate and velocity are related by where is the cross-sectional area of the flow and is its average velocity. 1: What is the difference between flow rate and fluid velocity? How are they related? 3: Identify some substances that are incompressible and some that are not. 1: What is the average flow rate in of gasoline to the engine of a car traveling at 100 km/h if it averages 10.0 km/L? 3: Blood is pumped from the heart at a rate of 5.0 L/min into the aorta (of radius 1.0 cm). Determine the speed of blood through the aorta. 4: Blood is flowing through an artery of radius 2 mm at a rate of 40 cm/s. 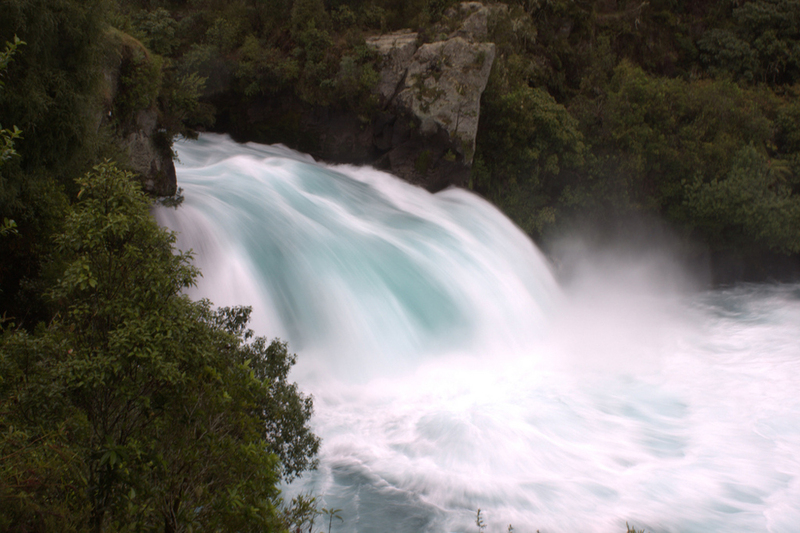 Determine the flow rate and the volume that passes through the artery in a period of 30 s.
5: The Huka Falls on the Waikato River is one of New Zealand’s most visited natural tourist attractions (see Figure 3). On average the river has a flow rate of about 300,000 L/s. At the gorge, the river narrows to 20 m wide and averages 20 m deep. (a) What is the average speed of the river in the gorge? (b) What is the average speed of the water in the river downstream of the falls when it widens to 60 m and its depth increases to an average of 40 m? 6: A major artery with a cross-sectional area of branches into 18 smaller arteries, each with an average cross-sectional area of By what factor is the average velocity of the blood reduced when it passes into these branches? 8: The human circulation system has approximately capillary vessels. Each vessel has a diameter of about Assuming cardiac output is 5 L/min, determine the average velocity of blood flow through each capillary vessel. 9: (a) Estimate the time it would take to fill a private swimming pool with a capacity of 80,000 L using a garden hose delivering 60 L/min. (b) How long would it take to fill if you could divert a moderate size river, flowing at into it? 11: (a) What is the fluid speed in a fire hose with a 9.00-cm diameter carrying 80.0 L of water per second? (b) What is the flow rate in cubic meters per second? (c) Would your answers be different if salt water replaced the fresh water in the fire hose? 12: The main uptake air duct of a forced air gas heater is 0.300 m in diameter. What is the average speed of air in the duct if it carries a volume equal to that of the house’s interior every 15 min? The inside volume of the house is equivalent to a rectangular solid 13.0 m wide by 20.0 m long by 2.75 m high. 13: Water is moving at a velocity of 2.00 m/s through a hose with an internal diameter of 1.60 cm. (a) What is the flow rate in liters per second? (b) The fluid velocity in this hose’s nozzle is 15.0 m/s. What is the nozzle’s inside diameter? 15: Water emerges straight down from a faucet with a 1.80-cm diameter at a speed of 0.500 m/s. (Because of the construction of the faucet, there is no variation in speed across the stream.) (a) What is the flow rate in (b) What is the diameter of the stream 0.200 m below the faucet? Neglect any effects due to surface tension. A mountain stream is 10.0 m wide and averages 2.00 m in depth. During the spring runoff, the flow in the stream reaches (a) What is the average velocity of the stream under these conditions? (b) What is unreasonable about this velocity? (c) What is unreasonable or inconsistent about the premises? (c) No, independent of density. 12.1 Flow Rate and Its Relation to Velocity by OpenStax is licensed under a Creative Commons Attribution 4.0 International License, except where otherwise noted.